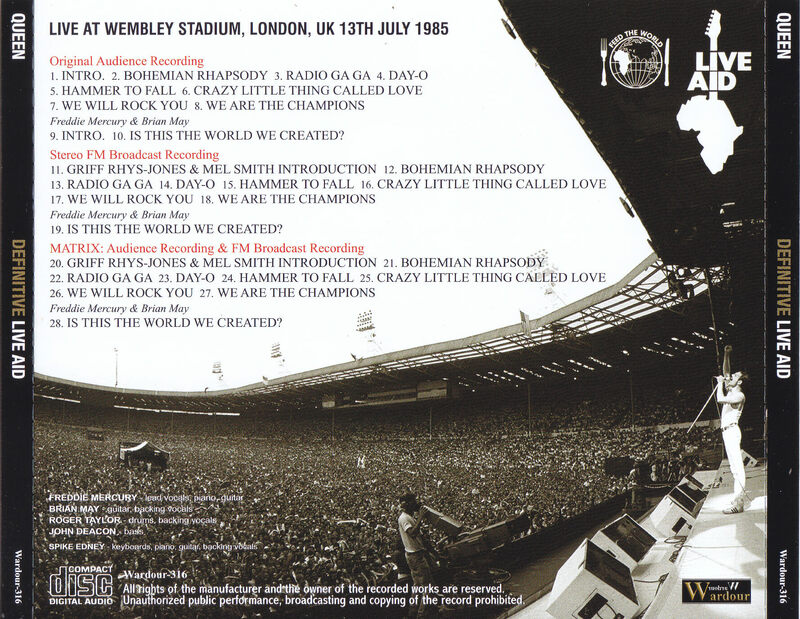 Recorded: Live at Wembley Stadium, London, UK 13th July 1985. Sound: Audience recording & stereo pro-recording. 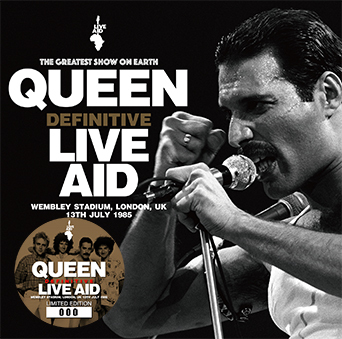 Comments: Wardour label released this recording on a cd in December 2018 named 'Live Aid' (Wardour 303). A month later Wardour re-released this live Aid show again. This time with a different cover and more (mixed) recordings. As previous release, a dvdr is also enclosed with stickers on a limited copies of this cd. The dvdr has a new cover, and comes in a separate cd case. Be wear that there is no different between the cd with dvdr enclosed separate, and the cd without the dvdr. I just want to inform this. I'm not sure about this MATRIX sound mix. Roots: Audience tape & professional recording. Time: 77:29 / DVDR 52:42 enclosed separate with some copies with sticker on front cover. 19. Is This The World We Created? 28. Is This The World We Created? DVDR with limited stickers CD copies. 9. Is This The World We Created? 18. Is This The World We Created? ★ This is a miracle matrix sound that will greatly impact all fans all over the world. Please enjoy the video experience of the masterpieces seen with this sound. DVDR enclosed separate with some copies with sticker on cover. ★ Shocking Kinema Master and the highest peak stereo soundboard, as well as the newly appearing Matrix Master Drawing a miraculous stage "Rival Bum" DEFINITIVE LIVE AID ". As long as the sticker with the first time limited number is attached, the pro shot "DEFINITIVE LIVE AID: THE VIDEO" which the picture was also upgraded with that matrix · master is attached specially. Shock Kinney Master and the highest peak soundboard, and a matrix that both of us can listen to the miracle compatibility ...... The main press CD drawn with three treasures "DEFINITIVE LIVE AID". That splendor is an unrelated super masterpiece such as no need for a bonus. However, the concept of this time is "to bring out the possibilities of the master to the maximum." That possibility is, of course, included in imaging. Yes, this work is a video work that synchronized the supreme sound of the main press CD with the official pro shot. There are 2 kinds of professional shots contained in such work. Let's introduce each one. First of all it appeared in the professional highest version of the professional record. It is the one which synchronized the highest peak FM sound board to the familiar multi camera · pro shot. 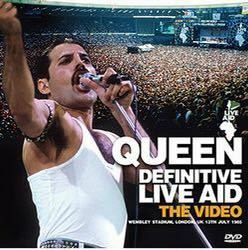 This stage is an official DVD, and all appearances of QUEEN are recorded. However, according to mania who has loved LIVE AID for many years, it is not the best, according to the verification. The picture quality is perfect, but the problem is speech. Manians are listening to the FM broadcasting people. This video is synchronizing FM broadcast to such multi camera · pro shot. I enjoyed the same type of concept with the bonus DVDR of "LIVE AID (Wardour-303)", but this work has been redesigned again. Although it is not a big upgrade, the scene of the comedian at the beginning which was television sound is also FM voice. The workmanship is wonderful when scales fall off with eyes and ears. Although I mentioned in the commentary of this volume, although the official DVD feels the cheer spectacle, the performance itself was small with a flat plate. However, in this work, you can experience the performance of miracles with a stereo feeling up to the brilliant of FM broadcasting. What's even wonderful is three-dimensional. Because it is a stereo, Brian May's cutting also sounds cleanly separated without hitting the synth, and it is even closer to Freddie's voice even though it is a crowd with audiences. Of course, it also includes 'Is This The World We Created?' Which was played with Freddie and Brian re-appearing at night (21: 48) as well as at the main stage from the evening (18: 41). Long before the first half of pursuing the extreme of professional record, the life of this work which is overwhelming far beyond is here. It is a transcendence version that synchronized the matrix master which was also included in the main press CD. This is another different thing anymore. It is too amazing. It's too amazing! Back from the big chorus boiling up at the beginning "Bohemian Rhapsody". It is a picture that I looked back over and burned back to my mind, but the sense of scale and the feeling of the scene are completely different. Even when the screen becomes Freddie's up, the chorus always catches the ears and the goose bumps do not stop with the furious presence. And "Radio Ga Ga" continues to make the power of the image mild. A huge audience claps hands on the rust, but you can hear the sound of the 144,000 palms held in front of you! The vast ocean of both hands wriggles according to the beat, and the moment it hits it sounds without a time lag. This spectacle was something that could not be any video / live album so far. Even at the highest peak FM sound board, the audience's presence is far, even if you synchronized the audience voice, Freddie would have been far. Because it is a matrix master, you can feel the presence of QUEEN and the big crowd at the same time. And, by joining up to the professional shot image where the angle is also freely there, everything in Wembley pot jumps into the brain all the way. Although it became long with only 2 songs, the impact will not stop thereafter. A huge amount of "Day-O" hitting each other's voices, a roar that Freddie boils up with "Hammer To Fall" playing with a TV camera. Even Kinney 's audience recording shows the scenes that I was listening to, appearing in front of me as a scene that has scaled up many times. And again, "Crazy Little Thing Called Love" the 144,000 palms turn into rhythm corps. In this song, the chorus is slightly smaller than other songs, but Freddie instantly takes a lead at the moment when it is conceived. Exquisite thing at that timing. The goodness of this Freddie 's genius Kang was also unable to be conveyed by audience recording without a spectacle, and it was not understood by the broadcast pro shot where the audience' s breath was far away. This work closes the curtain with the beauty "Is This The World We Created?" Produced by the fusion of the highest peak FM soundboard and the Kinney Audience. Matrix alone was compatible with miracles, but it does not mean to sublimate even pro shot images. The reproduction scene of the movie "Bohemian Rhapsody" was also strengthening the spectacle by making use of the latest CG, but this work is comparable to it. Moreover, all of the materials are genuine, "reality". It is realizing massive Hollywood class spectacle with overwhelming reality. Beyond the dimension called bonus copy of the main press CD, this work itself is astounding video work. Press CD and Proshot pursued the possibilities that Master had hidden to the limit. Please, please enjoy together. ★ This video is amazing. It is surprising that AUD + SBD MATRIX will have a tremendous effect so far. PRO-SHOT COLOUR NTSC Approx.53min.